As one of the most longstanding UK indie bands, The Wedding Present’s impact on independent music is infinitely present. Their primitive approach to the disillusionment of youth is salient in the sound of many of the subsequent bands of their ilk since their pinnacle in the late eighties and nineties. Most synonymous for their familiar depiction of relationships using acerbic wit, frontman David Gedge is a virtuoso when it comes to the bittersweet love song. Prolific and perpetually on tour, The Wedding Present are still going strong today, playing in full their 1987 debut George Best on their mini tour of sea-side towns, following popular demand from fans. After continually nearing chart success until 1992, the band were finally recognised after releasing limited edition 7” singles every month for a year. The tracks were then compiled as two LPs – Hit Parade 1 and Hit Parade 2 – and in keeping with their tendency to revisit the past, both albums will be played in full on their upcoming European and UK tour. Hayley Scott spoke to The Wedding Present’s sole constant David Gedge about the changing climate of the music industry, that infamous TOTP performance and his affinity for the sea-side. DiS: The Wedding Present seem to have this perpetual presence in music - still alive and kicking after over 25 years – what do you think has kept the band going for so long? DiS: It seems to me that nowadays bands have a shorter life span. Do you think that’s a reflection on the easy access of music now, i.e. the new ways in which we consume it, and what do you think are the biggest challenges musicians face right now in comparison to what you endured in the late ‘80s? I think the answer’s the same to both questions... it’s all about finance. There’s much less money to be made from recorded music these days and so it’s more difficult to sustain a career as a musician. Similarly, record labels no longer have the desire or capability to make a long-term investment in an artist. So I think these days, for a lot of people, it’s all about making a return as quickly as you can. And that’s the biggest challenge musicians face now, compared to the 1980s. DiS: What are your thoughts on this notion of pop eating itself, with increasing numbers of bands recycling the sounds of the past to rework it into something ‘new’? Do you think the future of music is in danger because of this? Or do you, like me, think it’s just a structural feature of pop culture? Well, obviously pop has always been cyclical to a certain extent, but these days I really struggle to hear anything ‘new’. I mean, bands in the 80s and 90s were recognisably influenced by their predecessors, yet they still managed to come up with an original sound. I don’t really hear that anymore. The only innovation I see these days is in the technology used... these new and ever increasingly sophisticated ways to produce, promote and distribute music. I don’t know if that’s a problem for the future of music... maybe people are happy to hear rehashes of the past... ‘retro’ is clearly a huge cultural phenomenon, whether it be for cuisine, art, fashion, film... so maybe that’s what people want! DiS: You formed The Wedding Present while you were at university in Leeds, does the place hold a particular significance to you because of that? Do you remember their being a cohesive music scene at the time? Well, I was also born in Leeds, so, though I grew up in Manchester, returning there for university was me ‘coming home’ to an extent. So, yes, the city is very important and familiar for me. One reason I went to Leeds University was because of the thriving music scene... it was obviously a place where lots of bands played. DiS: I recently came across your infamous lacklustre performance of ‘Brassneck’ on TOTP in which you appear fantastically unbothered about the whole thing. Was this kind of a two’s up at anything in particular? I’ve since seen you play that song with a lot more gusto! I was sort of influenced by the Brassneck promotional video where the entire band remained motionless while a troupe of dancers performed around us. I just thought I’d continue the theme for Top Of The Pops, too. At each studio rehearsal I became more and more extreme and I was really half expecting the director or somebody to come up and tell me off. But no one did... so I thought... why not?! DiS: Wedding Present songs have always been lyrically centered - can you talk us through the song-writing process? Do you have any contributions from the rest of the band members lyrically? No. I’ve occasionally invited other people to try their hand... to speed up the song-writing process, if nothing else... but it has never worked out. I suppose I have a certain style, which I’ve worked hard at creating, and so it’s difficult for other people to work within the parameters I’ve established. It’s also harder than people think! I spend a lot of time pouring over the lyrics... which is why I don’t start these days until the music is finished... over the years there’s been heartbreak when a lyric I’ve sweated over went to waste because the music hasn’t come up to scratch! DiS: The Wedding Present can be defined by the brilliantly bittersweet laments of love gone awry – John Peel once famously said “The boy Gedge has written some of the best love songs of the 'Rock ‘n’ Roll' era. You may dispute this, but I’m right and you’re wrong!” Do you still rely heavily on the grievances of relationships and love when it comes to song writing? I actually try to investigate all aspects of relationships... not just the love gone awry ones. I think I’m just fascinated by language and the way people speak to each other... what they say, why they say it, how they say it... and that sort of stuff works well in pop songs. But I think people especially remember the sad ones and the angry ones for some reason. DiS: The Wedding Present are often musically and lyrically primitive – George Best in particular has an elemental naivety to it; I think this is what essentially makes The Wedding Present so great, but have you ever felt the need to ‘mature’ or has it happened naturally? I think it has happened naturally. I hope so, anyway! I mean, when I listen to the lyrics of George Best today they do sound primitive and naïve and I don’t hear that on later albums. On the other hand, I’m a fan of rock ‘n’ roll... I wouldn’t want to The Wedding Present to become too sophisticated at the risk of losing the energy and passion. DiS: Since you reformed in 2004, you’ve done numerous tours playing George Best, Bizarro and Seamonsters in full. What made you decide to revisit those albums? Was it purely for nostalgic reasons? DiS: You said George Best is your least favourite Wedding Present album but your favourite to play live, why is that? It’s my least favourite album because it’s a bit one dimensional; I think on subsequent records we managed to incorporate more in the way of dynamics... light and shade, different tempos... it’s like anything, the more you do it, the better you usually become. But live, that doesn’t seem to matter because it’s just a 100mph, punky, thrashfest... and very exciting to play. DiS: Anyone who listens to your records knows that The Wedding Present have always primarily been a live band, touring profusely since you formed– why do you think it is important not to rely on studio production to instil the energy of your music into your audiences? To me, pop or rock music works well when it’s the sound of people playing together in a live environment. That’s not to say that I don’t like sounds produced in the studio as well... my other band, Cinerama, relies heavily on studio production, actually... but, as you say, The Wedding Present are ultimately a live band and we’ve always attempted to capture that in the recordings. DiS: It must be really hard work at times, why do you think you are so relentless when it comes to touring? DiS: You’re doing a seaside tour of George Best, playing the album in full in various sea- side towns across the country. I think this is a really wonderful idea – I’m assuming (like me) you have some affinity for the coast because you’ve lived in Brighton and Santa Monica. Is this a true analysis? DiS: Speaking of the seaside, you curate your own annual festival called ‘At The Edge Of The Sea’. What was the incentive behind putting this together and how did the idea come into fruition? DiS: Do you feel more at home in the US than in the UK? I imagine that pop culture there has a different role to play in American culture than it does here? When I’m in the UK I miss the USA, and vice versa, really. The grass is always greener! But I do like California, yes... and I know a lot of people over there now. I like the way that Pop Culture isn’t sneered at like it is here. It’s improved considerably over the years, I suppose, but I can remember when things like pop music, comic books were seen as exclusively ‘youth culture’ in the UK and you’d feel embarrassed reading a graphic novel on the train, whereas in America it was totally acceptable, presumably because so much pop culture is produced there. DiS: You’re going to be playing the Hit Parade albums in full on your upcoming UK tour, what are you most looking forward to about revisiting these songs? Well, they’re certainly more varied than the George Best songs, ha, ha. I think the Hit Parade series features some of the best ever Wedding Present tracks actually... things like Blue Eyes, Come Play With Me, Loveslave... and then there are some that are great fun to play live, like Flying Saucer. It’ll be interesting... it’s like reading your diary from twenty one years ago. DiS: What’s currently influencing you musically? In The Wedding Present we’ve always tried to avoid being influenced musically. I’ve never wanted people saying stuff like “that new song of yours sounds like... so and so...” So we always strive to be as different as we can, really... and that includes trying not to sound like previous Wedding Present releases, too. 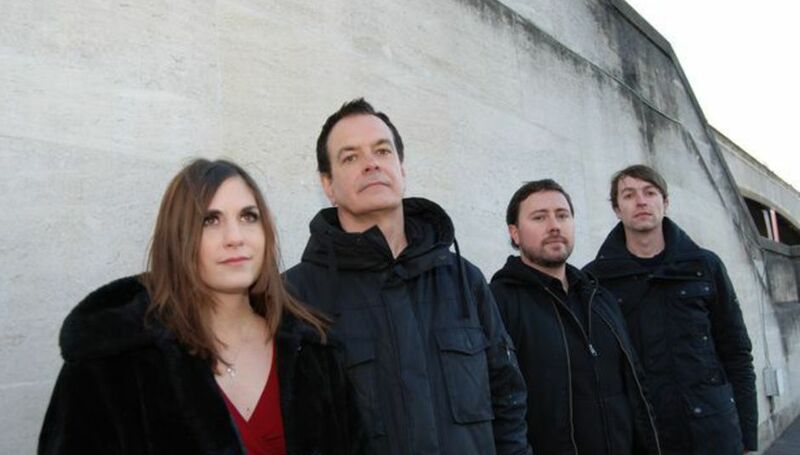 DiS: Are there any plans for a new Wedding Present album anytime soon? We’re always working on new material. Our guitarist, Patrick Alexander... I suppose he’s the ‘new’ guitarist, although he’s been in the band for almost a couple of years now... is literally always coming up with clever little guitar parts and arrangement ideas. It’s just a case of finding the time to convert them into fully formed songs, really... but I’m hoping that we’ll be able to record something next year.